The production in lakes has always been a major interest in ecological studies. Phytoplankton, often regarded as the major photosynthetic organisms in aquatic ecosystem, are driven by the sunlight. But in the boreal region where lakes receive a large inflow of terrestrial organic matter, the light penetration is often limited from a few centimetres to a few meters. This added allochthonous matter not only reduces the amount of photosynthetically active radiation (PAR), but at the same time is utilized by bacterial biomass as a source of carbon. And along with the phytoplanktonic respiration they exceed the total phytoplanktonic production resulting in an anoxic hypolimnia. In these environments, with reduced light intensity and reduced oxygen, a community of anaerobic bacteria, or green sulphur bacteria, (GSB) flourish just below the oxic-anoxic interface. Apart from the anoxic condition, this class of bacteria requires an environment with reduced sulphur compounds and use CO2 as a carbon source that is fixed via reductive tricarboxylic acid cycling. The cells of GSB contain a special antenna complex, chlorosomes, with bacteriochlorophyll photopigments that are capable of absorbing low light intensity thus, helping them to survive under such conditions. There have been many studies regarding the abundance of GSB in different environments and they have been shown to dominate in anaerobic water layers of stratified water bodies. Light plays the crucial role in photosynthetic reaction and has been suggested that light is the main factor governing primary production by GSB which is required in very low intensity. 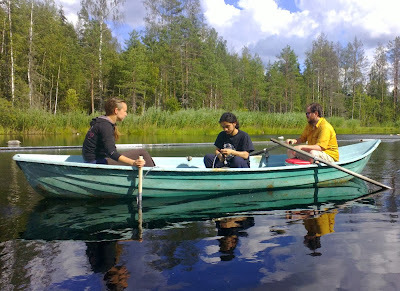 In summer 2011, I started my Master’s Thesis with the aim to quantify these anaerobic bacterial productions in small humic lakes. The study site was Evo forest region in Southern Finland and four lakes were chosen on the basis of the background study of those lakes. The primary focus of the task was to build a sampler that would allow the sampling of these bacteria without contaminating the samples by light and oxygen. Once the sampling succeeded, the next step was to measure the production by this class of bacteria. 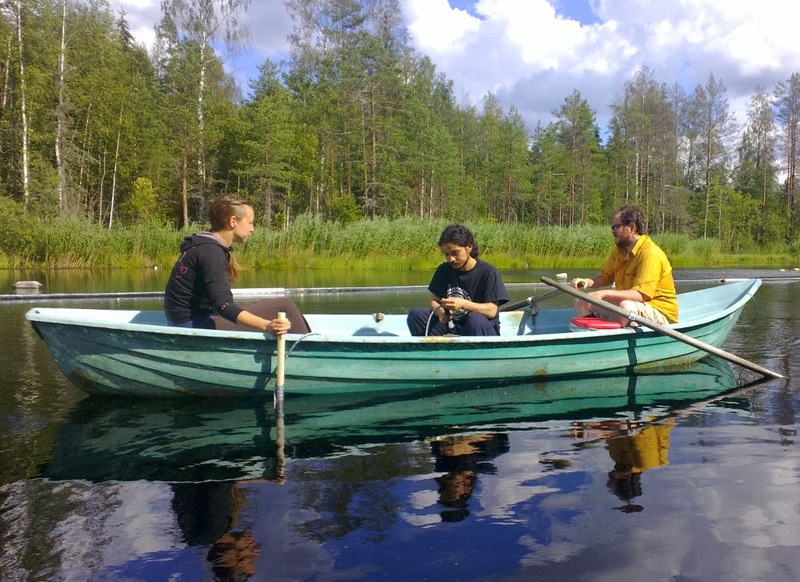 The results indicated that there might be some significant role of these anaerobic bacteria in humic lakes as their abundance was plenty in the hypolimnia of study lakes, and are thought to play a major role in primary production in humic lakes. The results of the findings needed to be interpreted more as the final results are still being processed (comparing with phytoplanktonic production). This study tried to shed some light in the basal resources of humic lakes that have been overlooked and still requires further research. Some of the future research questions might be: How much does their biomass fluctuates throughout the year? How does their abundance vary under the ice? How much of the carbon demand do they supply to the zooplankton, if anything at all? Thus, this new dimension, of lake functioning, needs further research in terms of their contribution to the whole lake ecosystem. Satish Basnet, originally from Biratnagar, Nepal, is a Master's student in Bio and Environmental Science at the University of Jyväskylä, and a 2013 LBAYS grant recipient.